To assume that the only way Africa can be saved is through nation-state modalities, and that the church can only contribute to this process by helping nation-state politics is ridiculous, especially in Africa, where the church has far more credibility than the corrupt nation-state institution. 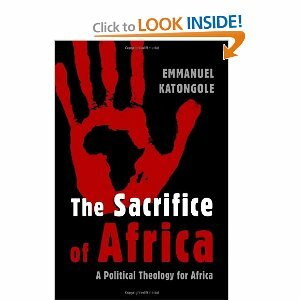 Thus writes Emmanuel Katongole, in The Sacrifice of Africa: A Political Theology for Africa (Eerdmans 2011, p 59). But isn’t a separation of “church” from the “State” precisely a “nation-State” modality? If the church is just the people, and some of those are in offices of civil leadership, then aren’t those offices of civil leadership as much the “church” as anything else? If one wishes to break free from corrupt nation-state institutions, why retain its basic divisions? And one might wonder whether the theological academy is really quite the same thing as the “church,” which almost certainly does have more credibility than the present nation-State systems imposed on Africa by Western and now globalist institutions. Katongole appeals to Milbank’s self-referential ecclesiology, whose proponents always assure us that though they sound abstract they’re really all about the concrete (in the abstract, of course). But Global Northern bourgeois manifestos of community self-infatuation elevated to the level of doctrine (pardon me, “narrative”), do exactly what they say they do: they forgo all attempts at objective knowledge, and performatively narrate the praxis of a community. Namely, the theological academy. Is the praxis of that community relevant to Africa? Does it really speak for “the church,” in Africa or anywhere else? It might be kinder perhaps to just leave that as a question. I suspect Katongole is right to say that African Christians ought to break free from bureaucratic post-colonial or more precisely neocolonial institutions. I wonder whether Milbank’s abstract church, with its praxis of academic bookwriting, and its deferral of the real question of governance by displacing it onto a civil-association “church” which has nothing to do with the “State”, is going to have much to offer such an undertaking. Instead of reading rarified analyses of what it might mean to be self-determining in the abstract, perhaps the Christians of Africa might be better off just self-determining: baptizing and developing Traditional African Leadership, developing flexible schools of law derived from divine principles, African customary law and useful Western formulations, founding their own educational and economic institutions, and keeping a cautious sovereign distance from multinational corporations, NGOs, and -perhaps – from the Northern theological academy too.